This came about when I had to run an errand at work, and brought my camera with me in case a photo-op presented itself. I was walking past a pond on campus that I have been by dozens, if not hundreds of times, and figured (incorrectly) that there was nothing interesting worth photographing. Then I remembered a suggestion my coworker Gina told me a long time ago, which was to simply look up. 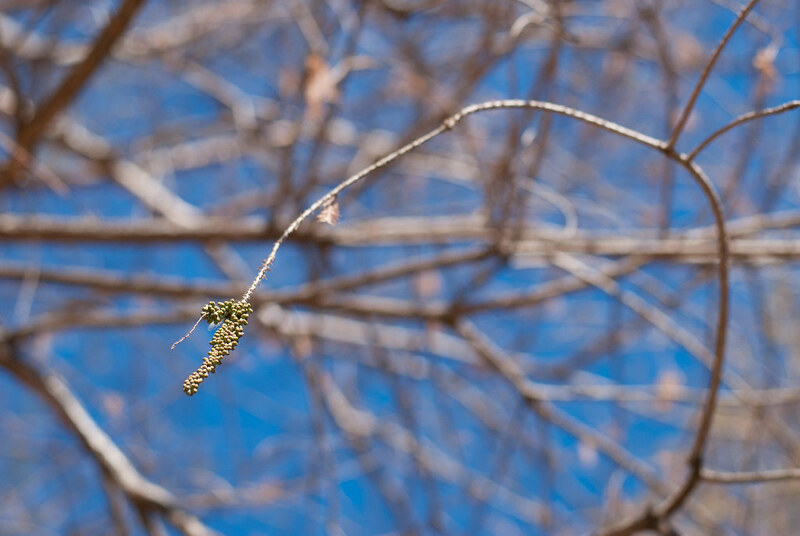 So I did, and lo and behold, I saw this tiny patch of green hanging down from the branch of a dormant cypress tree. I took this photo in early February, a time that I would not normally expect to see things turning from brown to green. And yet, there it was: a patch of life either hanging on through the winter or popping up before anything else. I thought it might be too far away to get a good shot, but it worked out OK and I didn’t even crop it very much.